This ongoing series is a tribute to one of my favorite poets, Wallace Stevens. 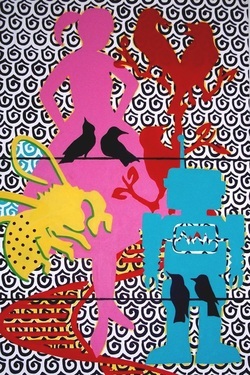 It is titled after his poem, “Thirteen Ways of Looking at a Blackbird.” It plays with the premise that these mysterious birds are messengers, but they do not give up their meanings unless they are convinced that we are ready to close the shutters of the rational mind, that we are prepared to be transformed. 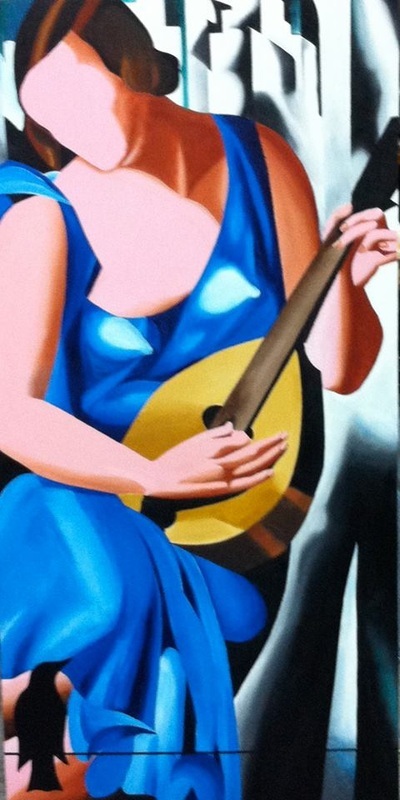 Measuring 12” x 42”, this acrylic painting is priced at $350. It features a row of seven divine oracles on a wire, only partially visible to the viewer through the symbolic veil of a chain link fence. 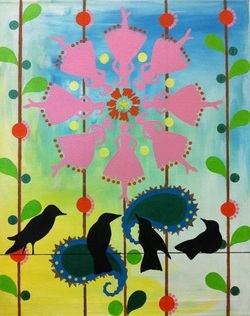 In this instance, the birds are symbolic of potential. 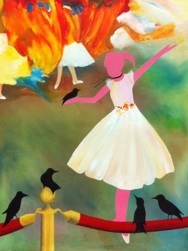 Because the gesture of each bird is different, the overall feeling of the piece is one of subtle disharmony. 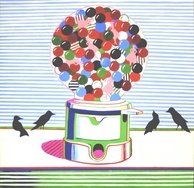 Only one bird is not obscured, and its upwardly focused body language provides the viewer with a clue that meaning must be found at higher levels of consciousness. The second painting in this series is titled, “Meditation in Red.” It measures 24” x 36” and is now in the private collection of Kara Silvey. 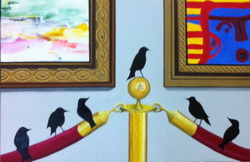 In this painting, the birds are placed in the forefront and are more readily accessible to the viewer. This is symbolic of our inner impulses having become exposed to the light of our own consciousness. In the private collection of Kara Silvey. 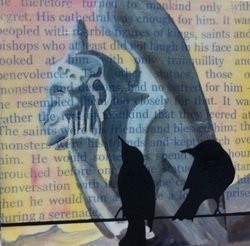 This small painting was inspired by the writings of Victor Hugo. The text behind the birds says, "He therefore turned to mankind only with regret. His cathedral was enough for him. It was peopled with marble figures of kings, saints and bishops who at least did not laugh in his face and looked at him with only tranquillity and benevolence. The other statues, those of monsters and demons, had no hatred for him--he resembled them too closely for that. It was rather the rest of mankind that they jeered at. The saints were his friends and blessed him. He would sometimes spend whole hours crouched before one of the statues in solitary conversation with it. If anyone came upon him then he would run away like a lover surprised during a serenade." Such incredibly beautiful language. This painting is in the private collection of David Yarbrough. This is the first time the girl has been in blue! In the private collection of Sharon Locke. In the private collection of Jane Cates. 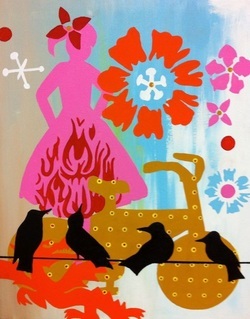 Currently on loan to Trinity Valley Title Co. through the Art Share program at Gallery 211. It is a relatively small piece, measuring 12" x `12". 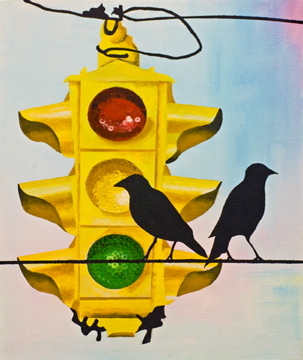 This image offers up a pair of blackbirds looking over a modern, if somewhat romanticized cityscape, and it examines the wistfulness of human nature. It stems from an old medical belief that ailments were caused by an imbalance in the four humors, in this case, an excess of black bile. 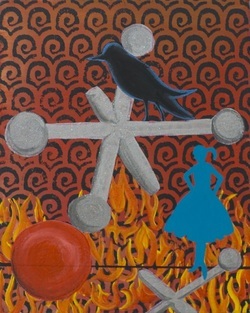 This painting then, considers all of the fears and despondencies that might impact the viewer. Ironically, with all of its softness and bright coloration, this painting represents a step back along the path to enlightenment. In the private collection of Candace Donnell. This is a small! 10"x14". In the private collection of Mia Tinsley. In the private collection of Mia Tinsley. Note: This series is an elaboration on 13 Ways of Looking at a Blackbird. 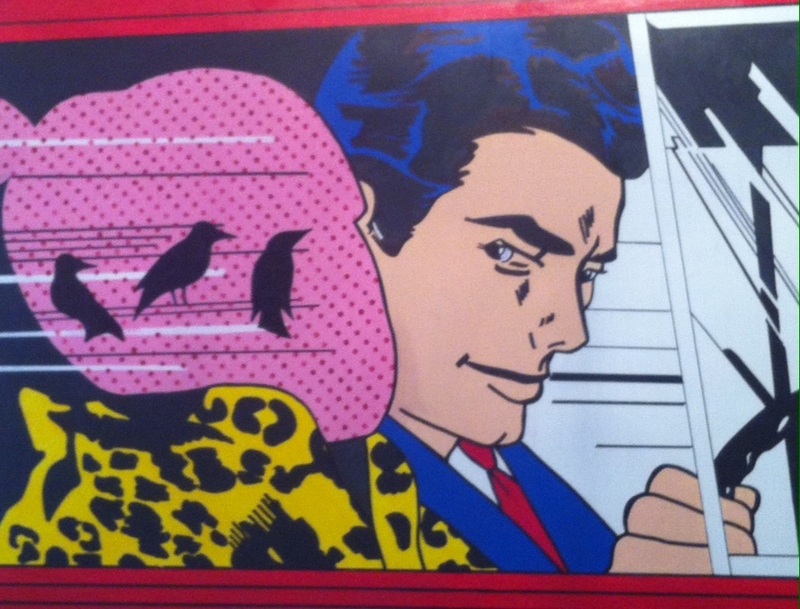 It began with "Get Back Jack," which included the first use of the Pink Girl. She went on to occupy several take-offs on works by famous painters. 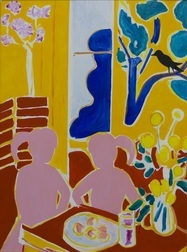 Inspired by Matisse, the pink girls take the place of two women in this 36" x 48" painting. 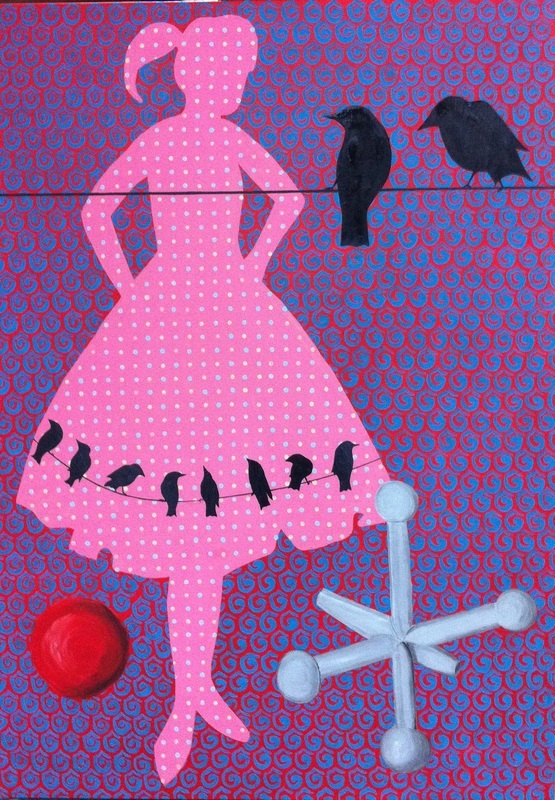 12" wide and 48" tall, this painting is a slice of a Rousseau tribute. 24" x 40" After Klimt. Brake Time offers a subtle commentary on the tension that can result between man and technology. The birds seem to be above it all, so to speak, but there is an ominous undertone here, hinting that technology will ultimately not leave them untouched. 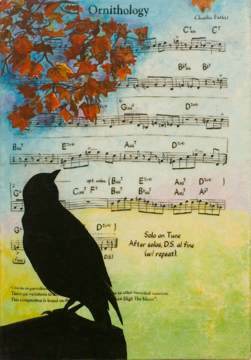 With Charlie "Bird" Parker's music in the background, Ornithology connects man and bird on many levels, and validates man's appreciation of music as well as the study of birds. 24" x 48" After Thibaud. 24" x 42" After Richter. Approximately 24" x 20" x 6"